Each year, Wisconsin Horse Council presents awards for the Horseperson of the Year, Judge of the Year and the WHC Director of the Year at the Midwest Horse Fair®. In some years there is also a Legislator of the Year. 2008 was the first year that nominations were accepted for the Special Achievement Award and Lifetime Achievement Award which will also be presented at the Midwest Horse Fair®. Recipients of the Horseperson, Special Achievement Award and Lifetime Achievement Award are nominated by the public and voted on by the WHC Board of Directors. The WHC Director of the Year and Legislator of the Year are nominated and voted on by the Board of Directors. The Judge of the Year Award recipient is nominated by the public and voted on by the WHC Judges Committee. 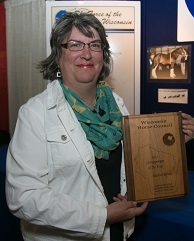 A tireless volunteer with organizations and at equine activities throughout Wisconsin, Rachel Meek of Madison is this year's WHC Horseperson of the Year. A true friend to the horse industry, Rachel volunteers at countless shows, doing everything from working the food stands to announcing. Rachel's organizational involvement is second to none. She's been a long-time member of numerous equine organizations in Wisconsin, and has served as project leader, chair, vice chair, treasurer, superintendent, and/or show secretary for many of them. She even hosts her own show at the end of the season, the "Time to Play Open Show", held the weekend before Halloween. Rachel is known and beloved by many in Wisconsin's equine community - and most of them couldn't think of a better person to be named the 2015 Horseperson of the Year. Pat Stevenson is a known and respected judge, holding cards in several associations, and was the first recipient of the Wisconsin Horse Council's Judge of the Year award in 2001. He's an exhibitor of champion horses, best known for a horse named 5P Hancock, who amassed over 100 AQHA halter points and was inducted into the Wisconsin Quarter Horse Association Hall of Fame. But his true calling may be as a mentor. For years, Pat has given free clinics to Vernon County 4-H groups and has mentored many of the youngsters in the area. He loves designing trail patterns and helping the kids navigate through the demanding courses. 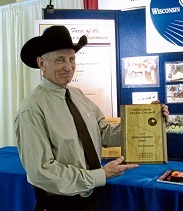 The Wisconsin Horse Council is proud to present Pat Stevenson with the 2015 Lifetime Achievement Award. 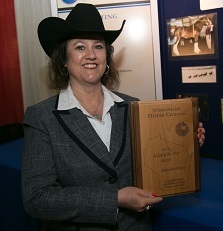 Veteran judge, consummate professional, and mentor to Wisconsin's young horsemen and women, Jean Sandmire is the WHC 2015 Judge of the Year. Jean's deep knowledge of horses is gleaned from her 26-year judging career and active involvement with 4-H and the Sauk County Horse Advisory Board. Always friendly, always courteous, and always seeking to learn, Jean attends WHC Judging Seminars annually, expanding her already formidable knowledge of judging rules and breed standards. She has donated a great deal of time to 4-H, serving as Horse Project Leader for the local club, and conducting clinics for kids of all ages. Her uncanny knack for communicating with today's youth makes her a particularly effective teacher. Congratulations to a person who has given so much of herself to Wisconsin's horse industry, Jean Sandmire.